Fritz and I have been doing some volunteer work on a couple of fronts. The three-fold brochure for a walking tour of the Historic District of the town of Raymond is finished and a first run was printed today. There will probably be some additions for later runs, but the Historical Society was very happy with the final mock-up and we're happy to have it done. The very simple, very New England building above is the local Quaker Meeting House in West Epping, just east of Raymond. It was built in 1851 and except for one electric line, four simple hanging lights and one electric outlet, it is unchanged from the day it opened. The interior is exquisitely simple. When Fritz and I had our Quaker marriage ceremony after we had done the legalities to marry in Massachusetts, we sat in front of the window on what's called the Facing Bench with other members of the Meeting, and special guests who were going to speak, on either side of us. The little bracket on the railing to the left of the aisle is something I built for one of the members who brings vases of cut flowers or potted plants for the Meetings which are on the first and third Sunday mornings every month. Meetings vary in form: some are open to spontaneous outburst as members are moved to speak, some have ministers like mainline Protestant sects while others, like the one here, are silent and amount to an hour of meditation. If guests are moved to speak, they are not silenced, but neither are they encouraged. Looking down from the Facing Bench to the back of the room. The panels on the left wall rise into the attic to reveal a mirror-image room on the other side. In the days when the Meeting had an extremely large membership, those panels were mostly up, allowing the whole membership to be together on Sunday mornings. However when business meetings were held, the panels were lowered so that the men on one side and the women on the other could confer privately on their separate responsibilities. The Meeting House is unheated but for the little box stove. The blankets are used as lap robes in fall, winter and spring. The Meeting House sits in a grove of towering white pines and has very little opportunity for solar gain -- it doesn't get particularly warm even in summer. As the stove is small and the stove pipe now by code has to be double-walled, it doesn't give off any near as much heat as the old single-walled pipe. So we all bundle up, keep our outerwear on, and wrap our legs up during our contemplative hours. The work we're doing here is in the attic which hasn't been cleaned out in a very long time. It is stacked in several places with raw cut lumber that had been laid in over the years against times when the roof needed re-planking. But whenever it had been cut, the sawdust and wood chips were never cleaned out; we'll need shovels for some of it The entire surviving contents of the Meeting House's 19th century library and some of the effects of the old First Day (ie. Sunday) School had been stacked in deteriorating cardboard cartons. There was also old, mostly damaged furniture and other discarded stuff. The big rocks hanging from the rafters are counterweights for the panels that slide up from below -- the slot they come up through is covered by the insulation bats that run down the center of the space. They are all written in the height of Victorian sentimental style and a secure belief in the total and unquestionable superiority of Christianity. Other books are biographies of Quaker luminaries, travelogues, commentaries on the scriptures, adult novels, bibles, hymnals and an one or two surprises, like a book of Ellery Queen crime stories! Japanese iris blooming in the big English country garden. A squirrel who had been a particularly vicious fight, The wound was deep and there was a second one on his hind quarters. He had come searching for seed dropped from the bird feeder but was moving in a slow, unsquirrel-like manner. The day lily garden on the leach field of the septic system. Trees and bushes can't be planted there because their roots would destroy the pipes that distribute water from the septic tank, but the shallow-rooted lilies are perfect. Less than half of them have flowered so far. A bird house that I'd been given for my birthday. It comes as a kit to put together and the pieces lock together without glues or fasteners of any kind. Unless there are some birds out there that mate very late in the season, it won't see action until next spring. It has a contemporary house design look to it. Sometimes (even often), the simplest architecture is the best. Quakers strike me as loving peaceful people. I've only met a few but they were all lovely. Your Quaker Meeting House piece reads like a little short story, photos almost not required! Pardon my enthusiasm. It prompted me to go searching for "Simple Gifts" (Joel Cohen, Boston Camerata, et al.) buried in the CD cabinet. In the process, I unearthed my lost "Piano Music of Rudolf Friml" -- very gay. And by that, I mean "spirited", of course;-) Thanks! Such simple beauty. The gardens, too. 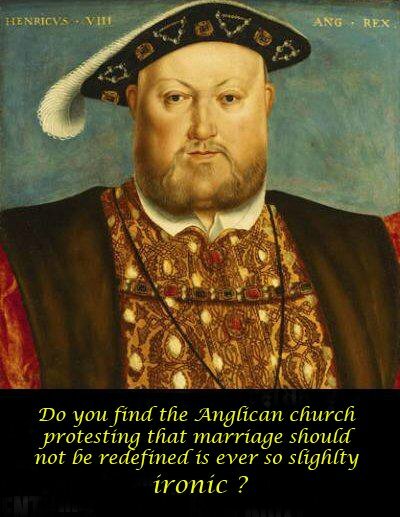 And I love the Henry VIII poster!